This aluminum, double edged training knife is not sharp. 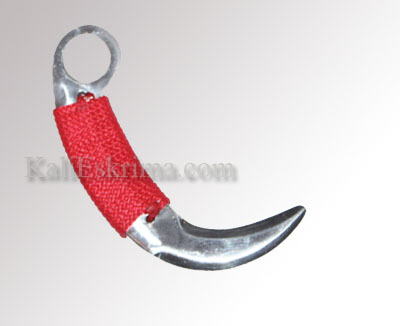 Red paracord on the grip makes this karambit comfortable to handle. Made in the Philippines. 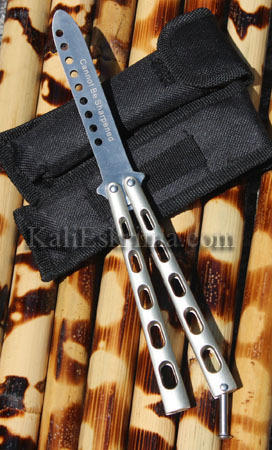 Also known as a butterfly knife, this double edged trainer is not sharp but allows FMA practitioners to train knife defenses and balisong opens. Blade reads, "Cannot Be Sharpened" for exporting purposes. Comes with nylon case with belt loop as seen in the photo. This site provides hardwood Filipino martial arts supplies such as rattan eskrima sticks, rattan sticks, and arnis sticks. Try some of our sticks and become a customer for life.